Honda's 2018-onwards CB125R is styled in the same vein as its larger CB siblings, the CB300R and CB1000R (which we reviewed here). 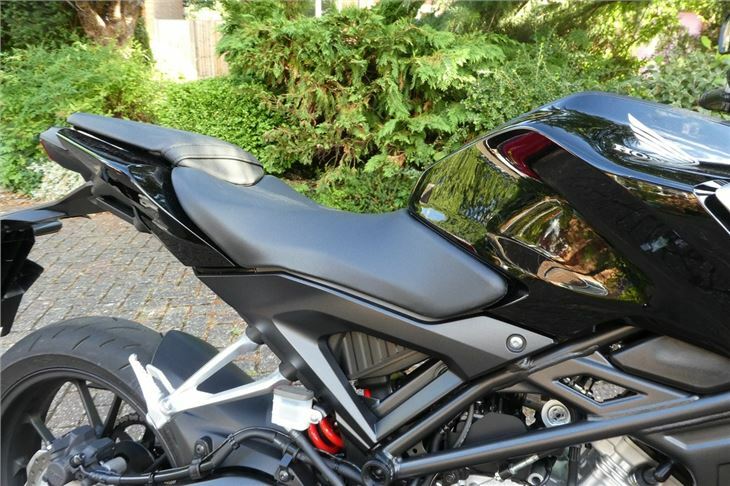 In fact, at a glance, it looks strikingly similar to the CB300R. 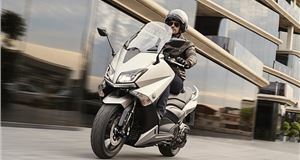 That's kind of the point, with Honda hoping that new riders enjoy the entry-level model so much that they move up the range when they gravitate towards bigger bikes. Priced at just under £4000, the CB125R is definitely at the premium end of learner bikes - so what do you get for your cash? This little bike offers big bike styling with high-quality parts, low running costs and lots of learner-legal fun to match. Plus, you get a strong dealer network with Honda – which can't be said for cheaper, Chinese bikes. Firstly, the looks. It'll be a matter of taste, but we think it looks great. It's more mature looking than other 125s (like the KTM Duke), but still has a cool factor about it. 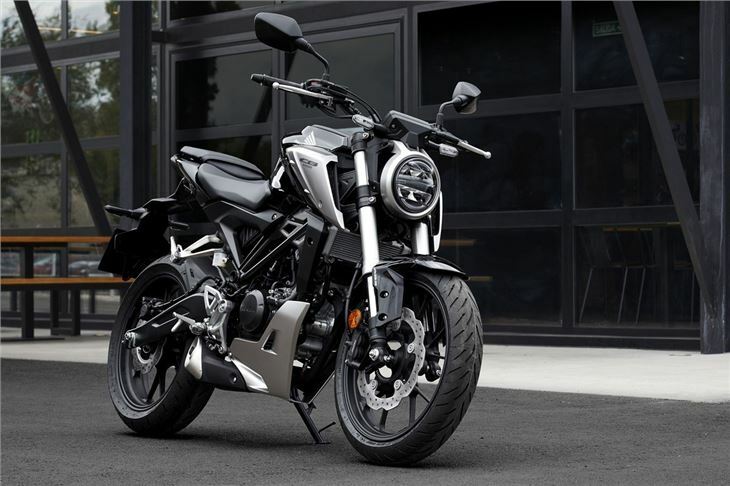 Honda labels the CB125R a Neo Sports Café bike, whatever that means, and it's got a few mentionable design features about it - like the upturned exhaust, beefy Showa forks and a digital LCD screen. In comparison to the weedy forks and basic equipment you get on lots of 125cc bikes, the CB125R screams quality. The riding position is neutral (if not mildly aggressive), meaning that it's fairly comfortable to ride and won't put too much pressure on your back or knees. It's one of the easiest 125s to get to grips with in our experience as well. The learning curve for new riders will be minimal because it's so easy to just get on the CB125R and ride without any gripes. If we have to nitpick, the front brakes aren't that sharp, but this will inspire confidence in new riders who won't like as much bite as we do. 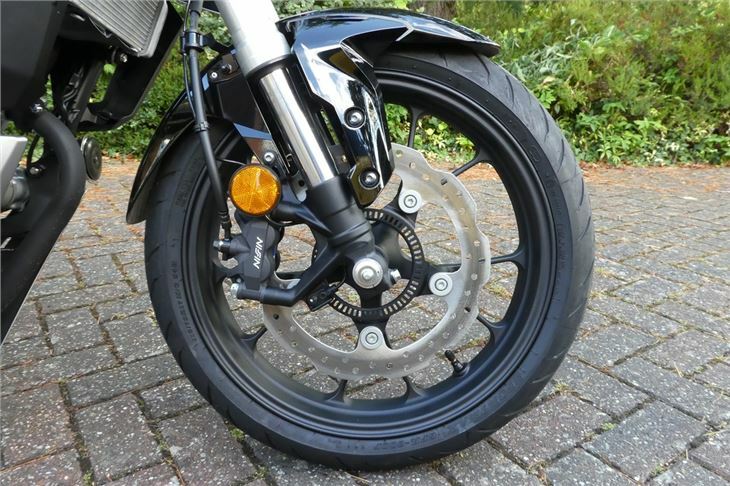 For us, the front brake is also a bit of a stretch, a span adjuster would be a useful addition but you probably don't need to worry about that unless you're a female rider or have small hands. The back end is tall and there's a sculpted fuel tank that's larger than the ones on most other 125s. The result is that riders should feel more secure sitting on the CB125R because it feels like you're more tucked into it. Despite looking like a bigger machine than it actually is, the bike is nimble to throw around on country roads and in town. The size makes it ideal for urban commuting with filtering through traffic not being an issue. The mirrors are also large and easy to adjust so we didn't get too much of our own shoulder blocking our view of what was happening behind us. 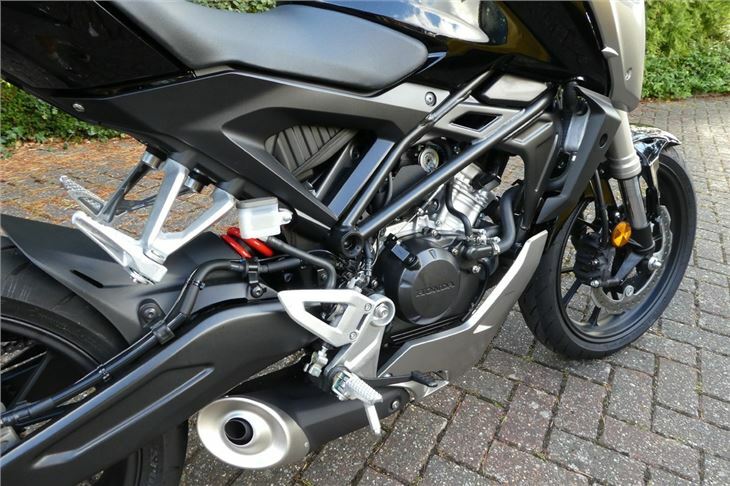 The exhaust has been designed to sit right at the centre of this 126kg bike for the best weight distribution. 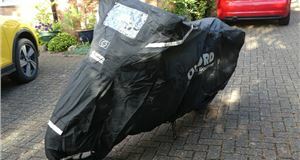 The low centre of gravity in the middle of the CB125R makes it feel very stable even in bad weather conditions. And, speaking of the exhaust, you can always hear the surprisingly gruff growl from the bike because Honda designed the muffler to point upwards. This aims to help new riders operate the bike based on what they can hear the engine doing. Smart stuff, right? The 124.7cc SOHC 2-valve, liquid-cooled engine offers a sweet, linear power delivery up to 13PS @ 10,000rpm with the red line at 11,000rpm for a claimed 0-50mph time of 11.4 seconds. 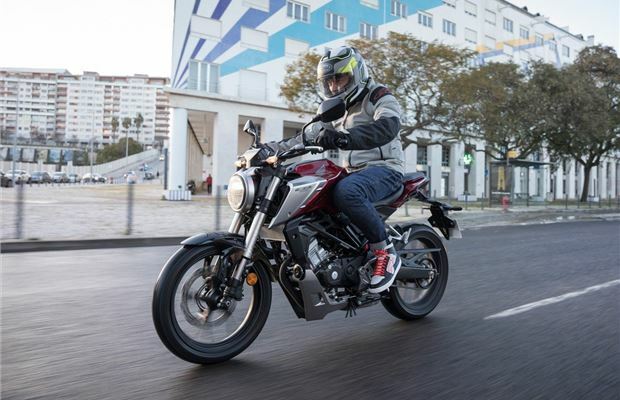 It doesn't feel particularly lacking while riding, it actually feels like it offers a decent amount of power, but it does put the CB125R a little bit behind typical 15PS 125cc rivals. Peak torque of 10.4Nm is reached at 8000rpm. This sounds a bit high up the rev range but we actually started to feel the power at much lower revs so it's quite a different experience than you might expect from reading the specs. We also often ignored the gear change indicator light on the dash when we needed to go uphill, overtake etc - but it's a useful feature for those who still need reminding to shift gears. It accelerates quickly and has no trouble keeping up with traffic, especially around town. We experienced far less false neutrals than on rival 125s we've tested as well. 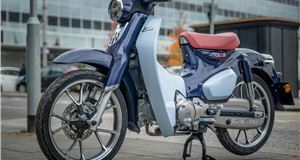 The light clutch paired with the six-speed gearbox complements the strong low to mid-range torque from the single cylinder engine and we saw top speeds of 82mph going flat out. But going up a steep(ish) hill on our commute (especially into a headwind) was - unsurprisingly - more challenging for this small capacity CB. Handling is a delight thanks to the previously mentioned low centre of gravity, wide handlebars and inverted 41mm Showa forks. Inexperienced riders can have confidence when taking corners, and the CB makes short work of the ever-pervasive pot-holed roads across the UK. Honda has fitted these same Showa forks to the CB300 too, which goes to show how decent the parts on the CB125R are in contrast to many of the cheaper learner bikes on the market. 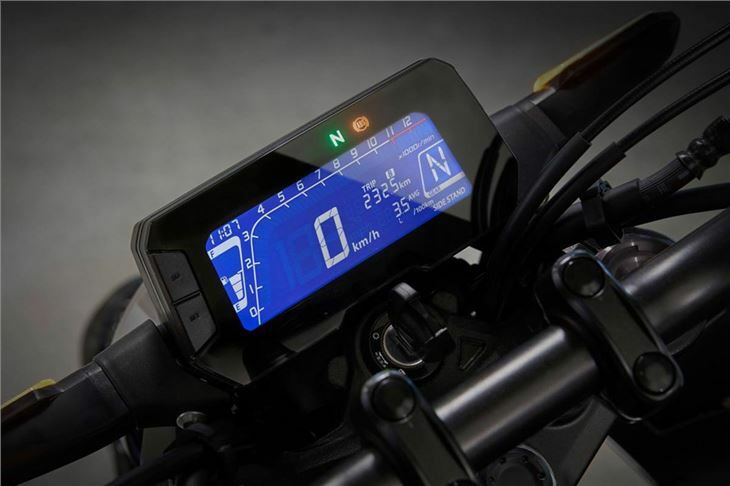 On the backlit LCD, digital display, there's a proper fuel gauge, rev counter, gear indicator, stopwatch and trip metre. It's all easy enough to read and there are only a couple of buttons used to navigate menus. 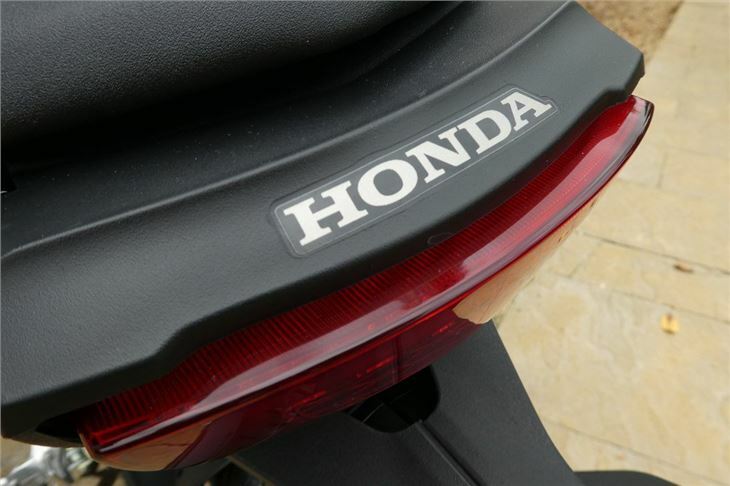 Honda claims that the CB125R is capable of 137mpg and around 300 miles from a full tank. We didn't quite match that, but we got around 120mpg. With petrol prices currently sitting at about 119ppl, that means you'll get a full tank for about £12 - not bad at all. Let's talk about money. After all, young riders will generally opt for whatever is priced best and looks coolest. At £3989, the Honda is a comfortable £260 below the more aggressively-styled KTM 125 Duke, but it's £90 more than the Suzuki GSX-S125. Finance deals are reasonable for the CB, with a 36-month PCP offer of £65 per month with a £580 deposit and annual mileage limit of 4000. Personally, we prefer the Honda over the GSX-S125 - it feels like more attention has been paid to the design with high-quality features and a sublime ride. It handles well and is reasonably economical. Yes, it hasn't got as much power, but the ride feels much smoother and easier to get to grips with. The Honda CB125R isn’t a bike for everyone. 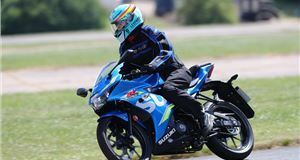 Suzuki's 125cc race rep, the GSX-R125 retails at £4099, which means you can get more power, a more aggressively-styled little sports bike and a fairing for just £110 more. And we're sure some 17-year-olds will go straight to a Suzuki dealer from their CBT and do just that. 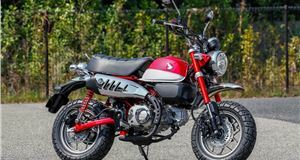 But for learners who want something a bit more agile and sophisticated, the CB125R is the machine we'd recommend.